ASP representatives were invited to CCF Malolos for “A Special Parenting Talk” by Malu Tiongson Ortiz, Vice President of Downs Syndrome Association Philippines through Jay and Mayan Crisostomo, CCF Malolos members, to a special parents' meeting last 21 April 2012 in Malolos, Bulacan. 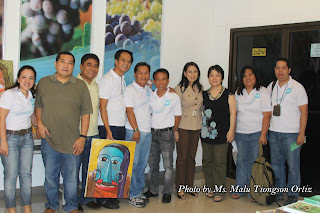 ASP was represented by Dr. Anawi Tolentino, President of ASP Malolos Chapter and JR Tan, Self-Advocate. An information table was set up to answer inquiries on autism and the upcoming 12th National Conference “Hope at Home”. The activity aimed to inform participants on the Biblical principles of parenting children with special needs, as well as work out a more understanding and inclusive environment for parents and children with needs inside the church. 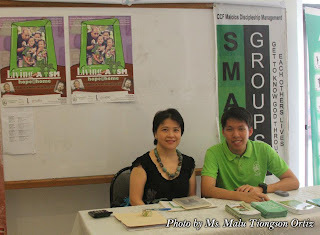 Mayan and Jay Crisostomo (right couple) with CCF Malolos . with CCF Malolos friends and volunteers. Dr. Anawi hopes to revive other chapter activities and looks forward to collaborative projects with other Bulacan towns and LGUs. She also sees CCF Malolos as a possible venue for future endeavors. As a token of appreciation, a copy of the ASP Directory of Resources was given to Pastor Rafael Robles. This will help aid inform parent members of their Special Needs Ministry. ASP representatives were treated to a sumptuous lunch and local delicacies after the seminar. Our special thanks to Malu Tiongson Ortiz, Jay and Mayan Crisostomo and CCF Malolos friends and volunteers for their generosity in making this event possible. ASP looks forward to a more understanding and inclusive place of worship for families of children with autism. Email us at autismphils@gmail.com for a similar activity in your church. hello ASP! :) im paulyn joy robles a student in a university. i have a question. do this institution use a Music Therapy for autism patient? thank you.